It's a dangerous thing, having expectations in life. It is especially dangerous, at least for me, to have high expectations of books. 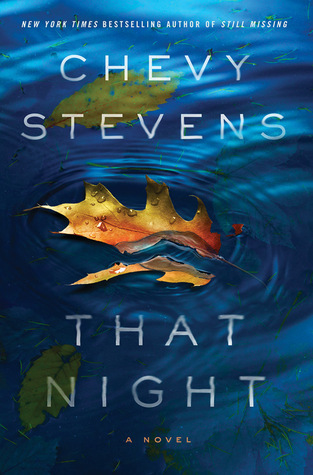 That Night was a book that rocked a synopsis I wouldn't need to think twice about picking up. A questionable murder, someone wrongly accused, the truth slowly leaking out in nail biting chapter after nail biting chapter!? Yes, PLEASE. Where do I sign up? However, this book failed to rouse me. I was highly anticipating the conclusion, there's no doubt, but the writing was juvenile, and the story line was just endlessly, and unnervingly, depressing. Toni is a rebel without a cause, at least initially. Told in alternating time periods-Toni's present day in prison/as a free woman, and her teenage years in high school-we slowly gain insight into a life that was relentless in it's downfalls. As a student, Toni was constantly teased and bullied by a horrid group of girls, at home, she and her mother were always at odds. Her younger sister, Nicole, is anything but an ally, especially when she decides to join forces with the wrong crowd at school, the same crowd that favours Toni as their target practice. Toni's one beacon of happiness, and hope, is her boyfriend Ryan. Things go from unbearable to tortuously horrible one night, when Nicole is found murdered during an outing with Toni and Ryan. With no other suspects in question, they are both sent to prison for 15 years, emerging older, but barely wiser. But they plan to be...they plan on finding out exactly who DID kill Nicole, and reclaim their lives. There was definitely a disconnect that existed for me with this book, there were things that were justified, and then things that annoyed the living hell out of me. The latter being the fact that Toni was just, plainly put, a spoiled brat when it came to her attitude with her mother. I'm not sure if the author intended for a feeling of solidarity, but I just didn't understand what was SO horrible about a mother telling her child to clean up her room, or try harder in school, or not get into fights. I DEFINITELY understood Toni's hurt, and anger, with her mother later on in the book, when she refuses to believe in Toni's innocence-I actually never hated a character's mother SO MUCH in my life at that point. I also found it hard to accept the "intense bond" that Toni and Ryan shared (side note: my boyfriend's name is also Ryan, so, in theory, this SHOULD have been easier). It just felt juvenile, all the way through, even when we were supposed to believe that almost a lifetime apart didn't take away from their "love". The definite shining point, and redeemer, in That Night, was the race to the truth. Despite being unrealistically fraught with bad luck moment, after bad luck moment, Chevy Stevens did a great job of building suspense; of causing me to question the innocence of more than one character. I wasn't exactly picking my jaw up off the floor when the "big reveal" happened, but it was a neat wrap-up, and I'll admit, I wasn't exactly expecting it to head that way. Overall, That Night was a perfect transition for those who usually prefer Young Adult fiction, and are looking to branch out into the adult genre. I will be giving Chevy Stevens' other works a try, in hopes of enjoying those a lot more than I did this book. Recommended for fans of: Contemporary, Mystery, Young Adult fiction, Karen Slaughter, Diane Chamberlain.